The relevance of gas turbines market is escalating gradually since the trend in consumption of energy is rising, which signifies market avenues for gas turbines firms. Few of the prominent players in the gas turbines market consist of Ansaldo Energia S.P.A., Alstom S.A, Siemens AG, Bharat Heavy Electricals Limited, General Electric Company, Mitsubishi Hitachi Power Systems, among others. These companies are making constant attempts aimed at designing and focusing on the development of new products to fulfill the mounting consumer demands. 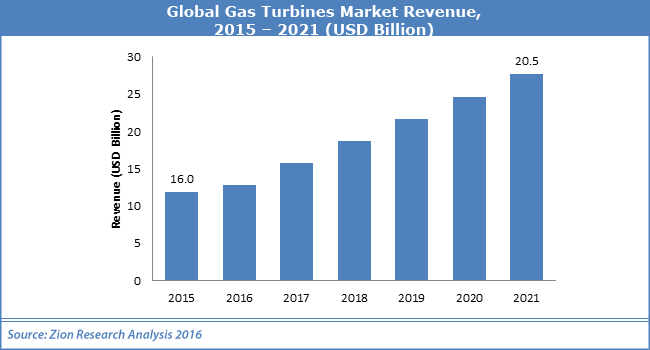 As predicted by the market report, the worldwide gas turbines market was esteemed at USD 16.0 Billion in 2015. The revenue of the Global gas turbines market is anticipated to attain USD 20.5 Billion in 2021 and is expected to develop at a CAGR of about 4% between 2016 and 2021. The gas turbine is an engine generally utilized at the power plant that produces electricity. It is also called a combustion engine that can transform natural gases and liquid fluids to mechanical energy. They are accessible in sizes spanning from 500 kW (kilowatts) to 250 MW (megawatts). Previously, gas turbines were only utilized for producing electricity, but nowadays they are one of the most extensively utilized power generating technologies. Gas turbines can be utilized in several manners for the generation of electricity as well as other forms of important energy. Mounting efficiency and resilience of gas turbines are key factors responsible for the growth of the gas turbines market. Stringent carbon emission rules around the world are anticipated to fuel the gas turbines market growth in the coming period. Moreover, the technological advancement and low power producing price are the other factors that drive the gas turbines market growth. On the other hand, extended start-up time, low sensitivity to amendment in power demand, and lesser efficiency at ideal speed are few factors that may impede the growth of the gas turbines market. This year, in July, Siemens has launched a new SGT-800 performance development that is relevant to all prevailing SGT-800 units with ratings of 43–47.5 MW. The new update is intended to offer operators and owners with noteworthy fuel savings and a decrease in CO2 emissions for enhanced sustainable energy generation. The industrial gas turbine market can be bifurcated based on design types which consist of aero-derivative type and heavy duty type gas turbines. In 2015, the heavy duty type gas turbine was the governing segment due to rising digit of large gas-fired plants and the stipulation for heavy-duty gas turbines. Further, the gas turbines market can be categorized by rated capacity turbines as above 300 MW, 120 to 300 MW, 40 to 120 MW, and 1 to 40 MW. The application segment of the gas turbines market includes power generation, oil & gas, and other industries. Of all the regional segments of the worldwide gas turbines market, the leading share in the overall market was held by Asia Pacific in 2015. This supremacy is mainly observed owing to the enormous population and elevated demand for electricity in this region. India and China are the most crowded nations in this region. In 2015, China alone utilized over 20% electricity in the world. Power production in Asia Pacific was backed by their massive amount of natural resources.